Raspberry Beret (from the Prince Collection) is a "luscious pink-red shade with red glitter and a non-linear holographic sparkle". 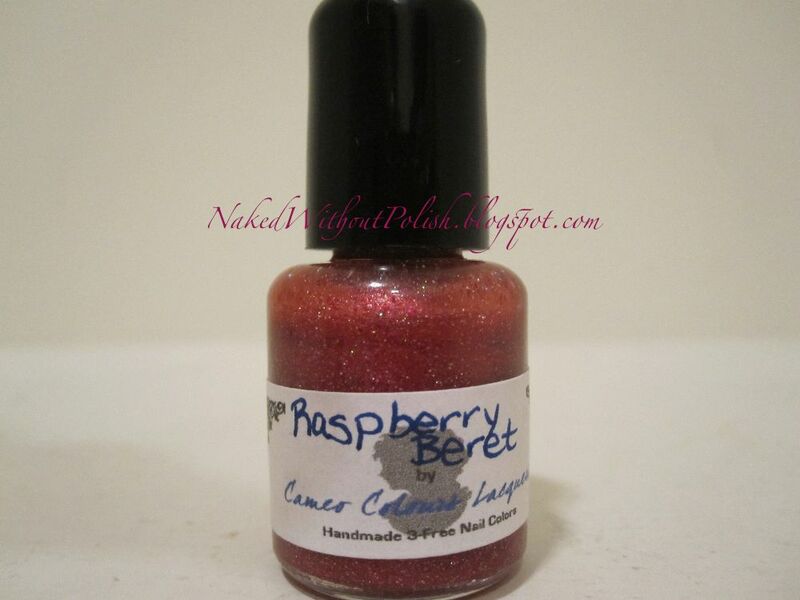 This is two coats of Raspberry Beret. This color just made me so happy! I'd walk around humming the song to myself. It put me in my own little happy place that I didn't want to leave...ever! The consistency of Raspberry Beret seemed a bit thick, but still allowed for me to do thinner coats like I prefer to do. So an instant worry turned out to not be an issue. It was a bit gritty, but a single coat of Seche Vite fixed that problem. Clean up was a breeze and the wear was wonderful! Come join me in my happy place!! 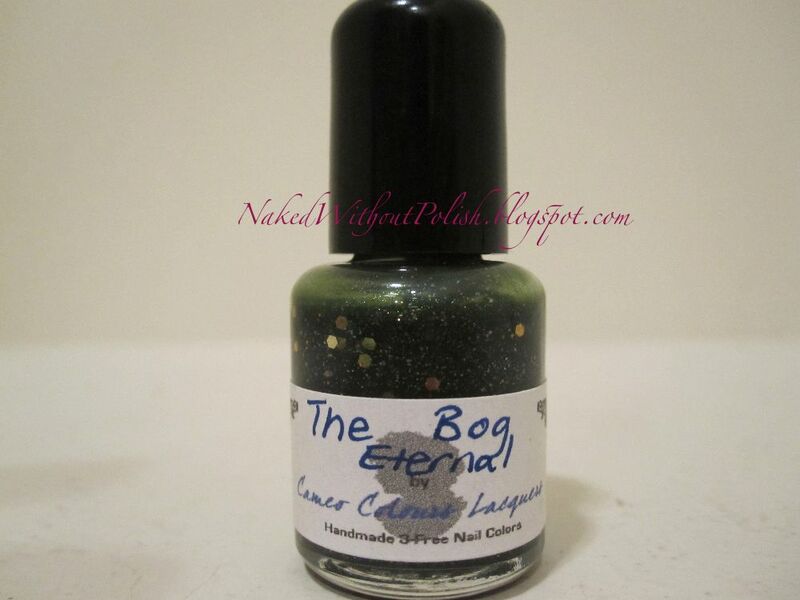 The Bog Eternal (from the Labyrinth Collection) is a "mixture of micro gold, bronze and silver glitters with larger bronze and black hex glitters in a shimmery [dark] green jelly base". This is two coats of The Bog Eternal. The Bog Eternal is a stunner! It applies smoothly no hunting for glitter. The glitter isn't over done, there's just the right amount. No clean up issues or staining. It had surprisingly great coverage for a jelly too! Very impressive! I love looking at the hidden black glitters that you don't always see when looking close up. 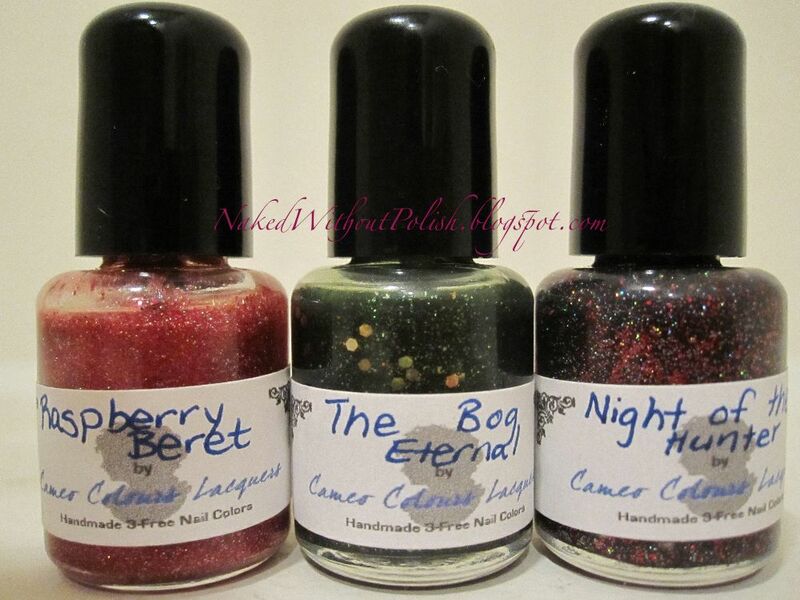 The Bog Eternal has put Cameo Colours Lacquer on my must watch list for 2013! I see big things happening for her if these polishes show off what her others are like! Don't waste any time in contemplating trying her products. Just do it! Last, but not least, is the STUNNING Night of the Hunter. 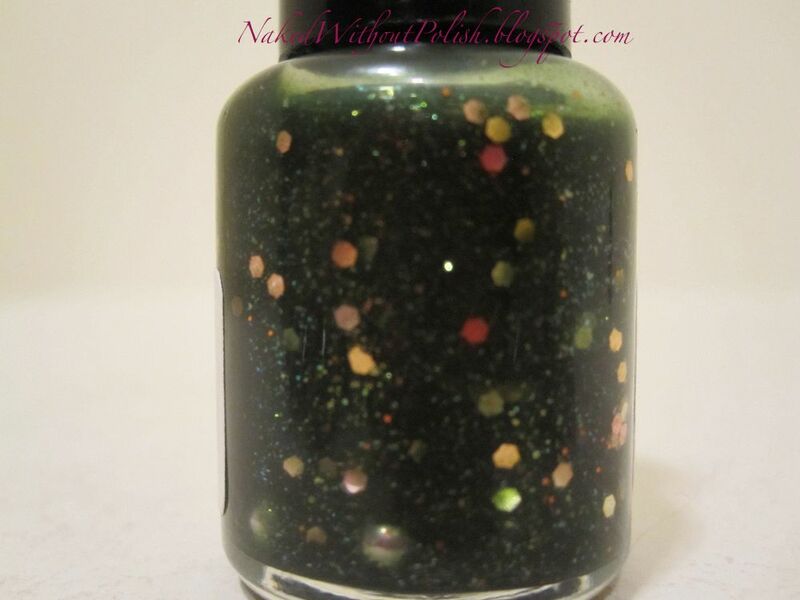 Hold onto your socks, cause this sparkle might knock you off your feet!! Night of the Hunter (from the Thirty Seconds to Mars Collection) is a "mixture of holographic and red glitters in a black base." This is two coats of Night of the Hunter. I was so shocked by Night of the Hunter once it was on my nails. It's beautiful!! The holo just pops when it hits the light just right. Completely opaque with full coverage in two coats. Abundance of glitter and just the right amount of holo. No issues with formula or clean up. It's an all around winner!! It looks a little gritty, but it's nothing a top coat won't smooth out. BAM! Look at that sparkle! LOVE it! RUN don't walk to your nearest computer or phone, hop on ETSY and head on over to Cameo Colours Lacquers shop and buy what your wallet can handle! Bottles range from $8 - $12 and are worth EVERY penny! Keep up with news and swatches on their Facebook page! I can't wait to try more of her polishes and see what 2013 has in store for Cameo Colours Lacquers!